Soi Thai is an authentic Thai Restaurant that opened its door in the heart of Tampines. Some interesting facts about Soi Thai, The boss is from Taiwan, but not to worry the chefs are from Thailand. From their FB page, they describe the Thai Chef with moustache is the head chef and the hairy one is the second in command. 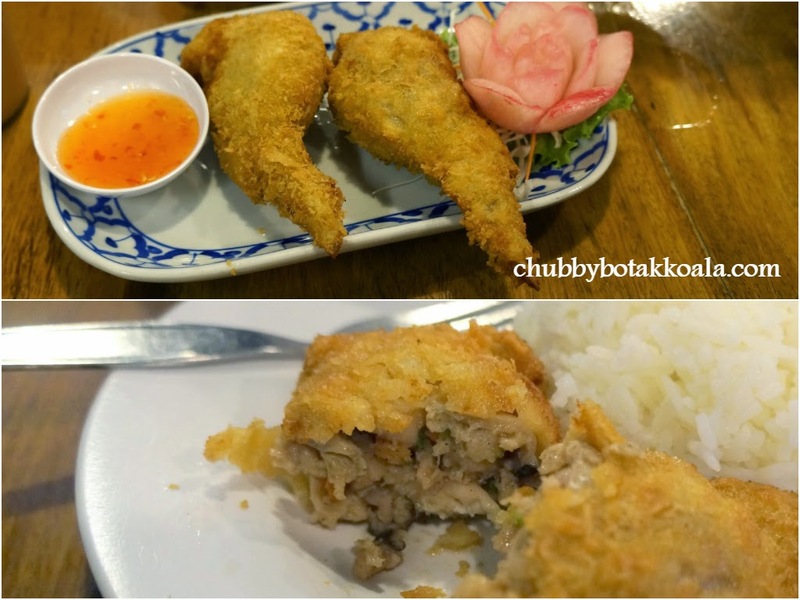 While we try not to compare Soi Thai dishes to the ever popular Nakhon, we have to face the reality that Nakhon has set the standard for Thai restaurants in the heartland. Therefore it is fair, if we compare the standard of their food. We started the dinner with Stuffed Chicken Wings ($6 – 2pcs), Thick Tom Yum Soup – Prawn ($7) and Boiled Cuttlefish with Lime Sauce ($10). The stuffed chicken wings was tasty and flavourful. It was crispy on the outside and served pipping hot. Good sign at the start. As you know I don't take tom yum, so according to LD, the taste was tweak to suit the Singapore taste. It will be better if it was spicier and sourer, be bold with the flavours. Boiled Squid was tender with a bit of springy texture, the lime sauce are not overly spicy. Green Chicken Curry ($9), Thai Style Kang Kong ($7) and Fried Sea Bass with Namjim Larb ($22) follow next. The chicken thigh meat in the green curry was very generous. However, the curry feels soupier, missing the thickness and richness of the lemak from the coconut milk. Thai style Kang Kong was good, crunchy and pack of punch from the chilli. The crispiness in the fried seabass was slightly inconsistent and a bit soggy in some part of the fish. The dipping sauce has the sweet, spicy and tangy taste, good to accompany the fish and removed the smell, however it was not to our preference. The yellow ginger (tumeric) chicken is unique. The tumeric is used to seasoned the meat provide a sweet yet appetizing flavour that wets your appetite. The Pad Thai is as authentic as its get. The Chef manage to get the right balance of sweetness and tanginess that truly show the authentic taste of Pad Thai. Kudos to the Chef. For desserts, we tried Red Ruby ($3) and Mango Sticky Rice ($5). The red ruby is average, missing the crunchiness. The sticky rice was too warm and it did not bind well with the mango and coconut milk. Overall, Soi Thai served a good authentic food. Pad Thai, Beef Paneang and Yellow Ginger Chicken is a must try. I never tried the last two dishes before I visited Soi Thai. In comparison to Nakhon, each of them have their different signature dishes, for food and quality standard, Soi Thai is comparable. So if you are looking for something different for Thai Food, give Soi Thai a try. Cheers!!! Mmmm...the seabass sure looks good but a pity to read that it is slightly soggy. But this place seems quite promising overall !! Yup, definitely a place to try, especially for Beef Paneang, Thai Yellow Ginger Chicken and Pad Thai.